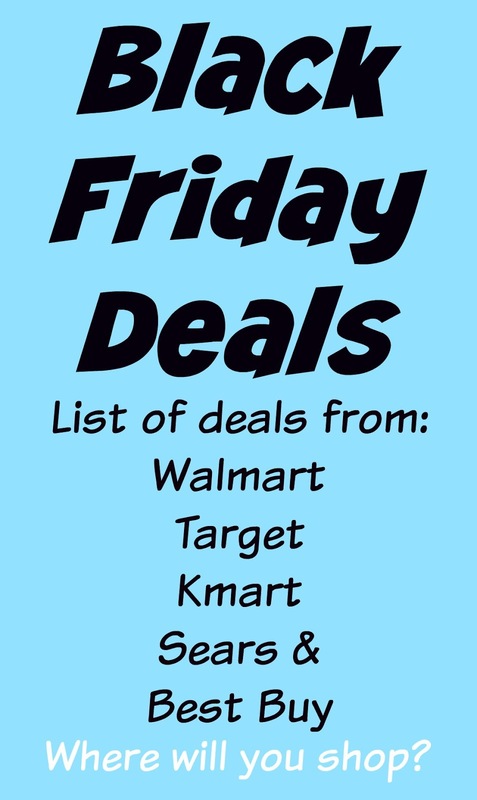 I am a pretty big fan of Black Friday, and I have been going out to the different sales for about 5 years running now. I really like getting a great deal on movies and other things for the house that we've been needing. I also like to shop for my kids picking up a couple of outfits and toys for Christmas as well as a back stock for birthdays and Easter baskets. 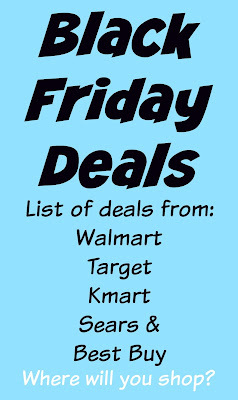 I created this post because I clicked on someones Ultimate 2015 Black Friday list and the post was put out there like it had ALL the deals in one spot but it really didn't, so I created my own using my favorite places to shop during Black Friday: Walmart, Target, Kmart, Sears, and Best Buy. I looked up the ads on BlackFriday.com and created a spreadsheet of the deals on popular items, from electronics and toys, to baby items, items for the home, and clothing. Don't forget to pick up your own ads or look at them online to check the times of any doorbusters! Click hear to see the spreadsheet! I hope it's helpful! If there are any big items I missed let me and the readers know in the comments below! I love Black Friday!!! I remember I used to get up at 5 am back in like, 1992 and go with my best friends parents. I guess I'm a classic Black Friday shopper. This is super helpful!! Happy I could help!! I won't be in town this Black Friday so I may be trying it out online! Thanks for stopping by! !